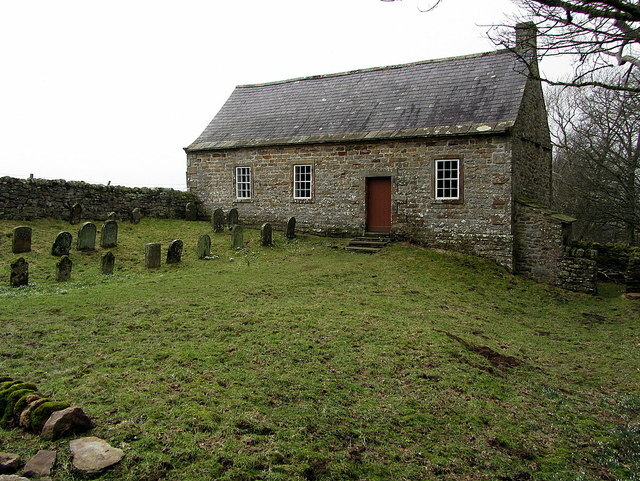 Quaker meeting houses are thin on the ground here in the North-East, but the one to be found at a remote spot a couple of miles east of Coanwood, Northumberland, is really rather special. 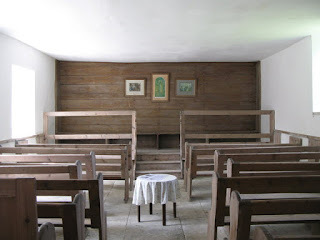 For it is one of the best examples of its kind anywhere of a Society of Friends’ meeting house which has remained unaltered, internally, since its 18th century construction. 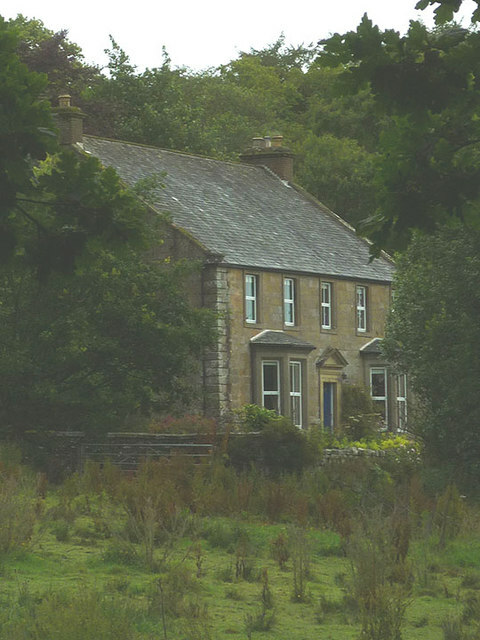 As a general rule these sorts of places were almost all remodelled in the Victorian era, but not so that at Coanwood – its remoteness no doubt helping it out in this respect. It was built in 1760 under the directions of Cuthbert Wigham, a local landowner and long-time Quaker, who had previously held meetings in his own house. Externally, the building is of sturdy stone construction, with a roof of Welsh slate – though it is thought this may have originally been heather thatched. Inside, however, little has changed in over two-and-a-half centuries. Within its robust outer shell can be found the simplest of layouts. Plain, open-backed pews face onto a raised area at the front where Elders’ benches are situated facing out over the congregation. At the rear is a movable screen designed to create a second room if required (which is heated by a small fireplace) and the whole of the interior is stone-flagged. Outside there is a small graveyard with the characteristically small, rounded headstones of the Quaker type – including that of Cuthbert Wigham, the house’s founder. The meeting house ceased operating as a Quaker chapel in 1960, but can usually be found open to the passing public. A little to the north of Featherstone Castle there sits Wydon Eals Farm. Many of the fields hereabouts are rather soggy, low-lying affairs, sitting, as they do, near the River South Tyne. Two centuries ago, a few yards to the NE of the farm, workmen digging drains made an extraordinary discovery in the shape of several ancient log coffins. The oaken caskets, uncovered in 1825, had been preserved by the swampy conditions, though what few bodily remains still contained within soon turned to dust when exposed to the air. In time, more were discovered – in 1859, 1863 and 1869 – and it is likely that still more remain underground. The most substantial body part found intact across all the finds was that of a skull fragment. 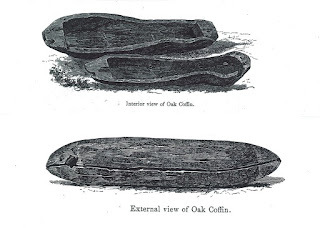 As can be seen from the illustrations, the primitive coffins have the appearance of hollowed-out canoes held together by pegs. For decades they were thought to date from the Bronze Age (c.2500BC – c.800BC), but scientific examination of one of the artefacts in 2011 placed them squarely in the Dark Ages at around the late 7th – early 8th centuries. Obviously, the site must have been a small cemetery of sorts, though there is no other evidence around and about to support the theory. Some of the coffins found their way into the hands of the Society of Antiquaries in Newcastle, and others were kept at nearby Featherstone Castle – with one possibly ending up in Durham Cathedral. 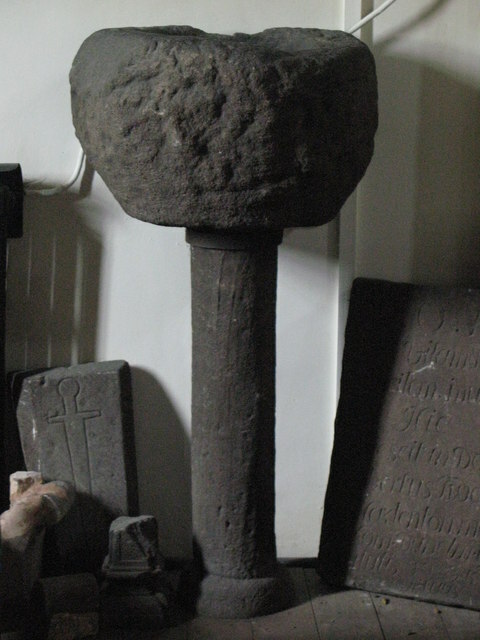 No one will perhaps ever know anything of the people who planted these relics (whether, for example, they were Christian or Pagan), although the land hereabouts is recorded as ‘Temple Land’ in 1223, and was at one time owned by the Dean and Chapter of Carlisle. (1) The locals claim with absolute certainty that their little town is located at the geographical centre of Great Britain. The thing is, it depends on what method of calculation you use to work out such things; and, because of this, several locations across the land make the same claim. It’s complicated, but Haltwhistle’s case is based on the fact that it is on the midpoint of the longest north–south meridian running the length of the country and is also approximately at the midpoint of each of the lines through it across Great Britain along the 16 main compass directions. The claim is in some ways ‘stretching it’ a bit, but in others really quite convincing – the Wikipedia entry here may be of some interest to those of you keen to take the matter further. (2) The parish church of Holy Cross, Haltwhistle (NY708640), contains an ancient relic known as the ‘old water stoup’. It is a roughly-shaped stone bowl on a stone column and is distinctly unimpressive, if the truth be known. The great Christian missionary, Paulinus – who is known to have been in Northumbria during 625-32AD doing his thing – is said to have used the stoup as a font for baptismal purposes. Possibly. As for its origins, the old font/stoup may well have begun life as a Roman altar. Possibly. (3) There is an old disused railway viaduct to the south of Haltwhistle called Alston Arches (NY709638). 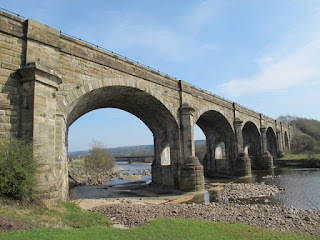 It spans the River South Tyne before the line it used to carry curled away towards Alston to the south. It is a remarkable and quite beautiful survival, but is especially notable for the conspicuous archways it has running through each of its supporting piers. No one quite knows why they are there. It was once assumed that there was a plan to drive a footway/bridge through the gaps for pedestrian use, which is a lovely (and surely unique) concept; but it is more likely that they were built into the bridge’s construction to lighten the structure’s weight, which is built on timber piles. How boring. If you’ve read one of those old histories of the region you may have come across mention of the Roman Wall as Severus’ Wall, rather than that of Emperor Hadrian. The process of change of the origin of the famous structure from the former (c.200AD) to that of the latter (c.120AD) was a gradual, 19th century evolution; and one of the clinching pieces of evidence in favour of Hadrian was the discovery of the Thorngrafton Hoard, which originally saw the light of day in 1837. The treasure in question was found by a group of workmen who were re-working an old Roman quarry on Barcombe Hill a mile south of the Wall near Bardon Mill (they were mining stone for the construction of the Newcastle-Carlisle railway). 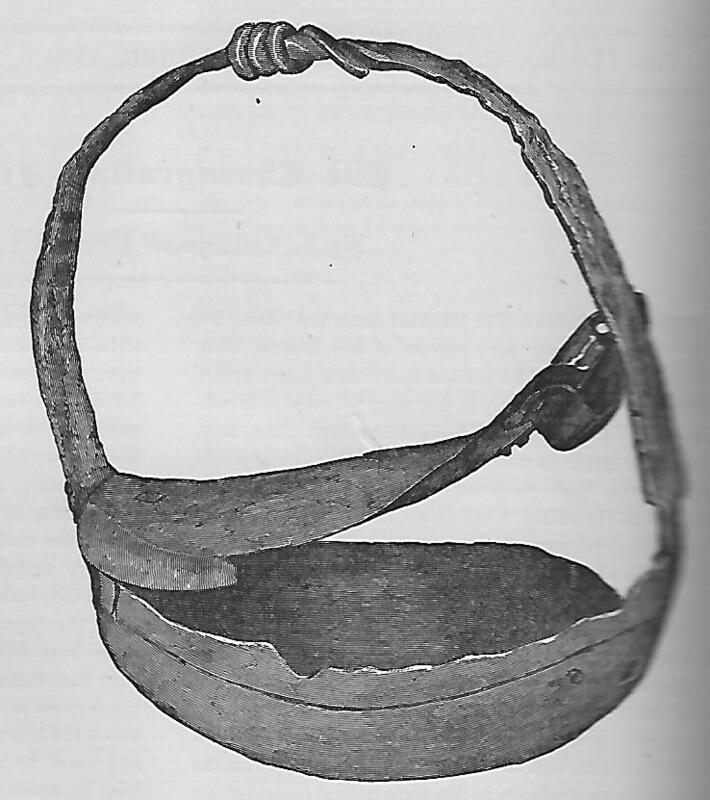 The hoard consisted of a bronze arm-purse packed full of coins lodged in a cleft in the rock – seemingly left there by an absent-minded labourer during the Wall’s construction. The majority of the 63 coins were silver, but three were gold. One of the men, Thomas Pattison, was entrusted by the gang with the profitable dispersal of the goods as best he could by hawking them around local markets and pubs. Though he couldn’t quickly move them on, interest in the find did gradually grow – and with it Pattison’s own self-evaluation of the items. The collection was properly scrutinised by ever more expert eyes, until, inevitably, the agents of the Duke of Northumberland tried to enforce the law of treasure trove. To cut a long story short, Pattison then embarked on a prolonged period of cat-and-mouse with the authorities, who, despite obtaining a court order in favour of the Duke, were unable to secure either the coins or Pattison himself, who scarpered to Wales. The coins had, in fact, been left with Pattison’s brother, William, before his escape south. But the law soon caught up with Thomas and he spent a year in jail in Denbighshire as a debtor (to the extent of the value of the coins, being £18). Returning home a broken man, he lodged with his brother until his early death – after which his sibling continued to guard the hoard against all interested parties. Eventually, though, William gave in, and the hoard was, in 1858, purchased from him by the famous antiquarian, John Clayton of Chesters – who, in turn, was able to obtain the permission of the Duke of Northumberland to retain the treasure. But what of the coins’ link to the dating of the Wall? Well, it all boiled down to the dates of the coins themselves. Being found in so close a proximity to the Wall, and in a quarry known to have been used for the Wall’s construction, their original ‘loss’ could without doubt be dated to the era in which the great monument was raised. The 63 coins bore the heads of several Roman emperors from Claudius through to Hadrian, but nothing beyond the latter’s reign. Moreover, the Hadrianic coins were in mint condition, and few in number … thus placing their loss – and, therefore, the Wall’s construction – to c.120AD. Despite the happy ending to the story, the coins were mysteriously lost after the sale of the Clayton estates in 1929, with only drawings made from sealing-wax impressions of them surviving. However, the bronze receptacle in which they were found can still be seen in the museum housing old John Clayton’s collection at Chesters Roman Fort. Wild-flower wreaths for Beauty’s hair. Astride the Northumberland-Cumbria border, where the River Irthing swings down from the north before turning westward, can be found the little town of Gilsland (on the Northumberland side) and Gilsland Spa (on the Cumbrian). Opposite the latter, across the little valley, can be found Wardrew House, now a private residence but once a hotel. During 1797, the famous Scottish novelist and poet, Sir Walter Scott, stayed there for a three month break whilst taking the waters of the nearby spa. Inspired by the flora of the district, Scott composed the above piece – his efforts fuelled, too, no doubt by the whirlwind romance he enjoyed during his stay in the area with his future wife, Charlotte Genevieve Charpentier (or Carpenter). Miss Carpenter, an émigré from the French Revolution, was at the same time staying at The Shaws Hotel (which formerly stood on the site of the Gilsland Spa Hotel over the river from Wardrew), and Scott supposedly proposed to the young woman at the famous ‘Popping Stone’ a little upstream from their respective hotels. They were married in December 1797 in Carlisle. Coincidentally, Scott’s compatriot, Robert Burns, also stayed at Wardrew House a decade before, in 1787. The house was originally built in 1752, but was much modified after a period of dilapidation in the 19th century.